First Responders – City of Green Lake, Wisconsin – Home of the deepest lake in Wisconsin! 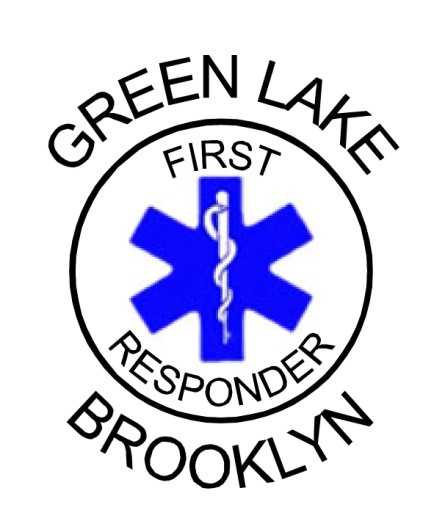 The Green Lake Brooklyn First Responders (GLBFR) operates as an Emergency Medical First Responder Service Provider under a State of Wisconsin license/certificate (#6050115). We have 7 members, individually licensed/certified as Emergency Medical Responders (EMR) by the State of Wisconsin Department of Health Services. They volunteer to help provide pre-hospital care for 911 dispatched medical emergencies (including vehicle accidents) in the City of Green Lake and the Town of Brooklyn, as well as part of the Town of Green Lake. During 911 medical emergencies, we work with ambulance services (Berlin Emergency Medical Service and Southern Green Lake County Ambulance Service) and rescue crews (Green Lake Fire & Rescue) as well as law enforcement (Green Lake County Sheriff’s Office and the City of Green Lake Police). Training is an ongoing process and individual and provider service license/certificates need to be renewed every two years. The EMR renewal requires an 18 hour course plus CPR renewal training. We meet at least once per month to take care of business and to train. We also train with other organizations including ambulance services, law enforcement, and a trauma hospital as well as attending an annual EMS training conference. The GLBFR respond to approximately 200 calls per year and are available all day and night, everyday of the year. We have an annual operating budget provided jointly by the City of Green Lake and the Town of Brooklyn, and host an annual Golf Outing to raise money for the service to use.